On behalf of all of Peirce College, I would like to extend a warm welcome to our new trustees, Renée Byng Branch, Dr. Al Dinson, and Geoffrey R. Haefner. All three were elected to our Board of Trustees during our board meeting on Thursday, Feb. 25. The continued growth in size and diversity of Peirce College's Board of Trustees is significant for the College and our students and alumni. Each trustee brings unique experience, insight, and ideas to the table that will help not only with the Peirce College strategic planning process, but also help ensure that we are providing the programs, resources, and services that are required now, and into the future, for students and alumni of Peirce. A full press release with detailed information about each new trustee is included below. Going forward, Peirce Connections will begin publishing profiles of and interviews with our Trustees in an effort to familiarize students and alumni with their backgrounds and the work of the Board itself. Peirce College held its first Ambassadors Club meeting last night on campus. Stephen Ampersand from Peirce's Admissions Office will talk more about the club's focus and goals in the coming days, but I wanted to share some of my impressions from last night's meeting. 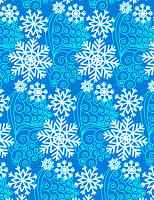 First, a little background. For many of the students that attend Peirce, whether at our campus in Philadelphia or online, their time at the College often turns into a life-changing experience. Many of these students turn into wonderful mentors and true ambassadors for Peirce College and continuing education. We decided to formalize some of the great things these students were already doing by forming the Ambassadors Club. The first meeting with the Ambassadors Club typified one of the great characteristics of Peirce -- the engagement of all factions of the community. It was delightful to find so many students genuinely enthusiastic about their Peirce experience and, most significantly, willing to share it with others. It seems that whenever we ask our student body to support the institution, there is always a very positive response. When we spoke about their roles as ambassadors representing the College, they quickly identified with the win-win-win scenario we strive for. The College wins because it will extend the reach of its mission; the ambassador wins because Peirce becomes even more well known and well regarded by serving a broader base of people, making their degree more recognizable and valuable in the eyes of employers and others; and the community-at-large wins because more citizens attain college degrees, making the workforce and our city stronger. I continue to be enthralled with the prospects of how powerful a unified Peirce is for students and the community. Yesterday evening with the ambassadors was another example of how we can leverage our experiences and skills to give the College a stronger presence in the elevation of the area's degree attainment level. Kudos to the folks in our Admissions and Marketing/Communications groups for organizing this new and highly important initiative. Yesterday, I attended Mayor Nutter’s announcement and grand opening of the new PhillyGoes2College office in Philadelphia City Hall, which is designed to help Philadelphians of all ages find their way more easily into colleges and universities. A feeling of pride came over me as I listened to Mayor Nutter speak in support of the goal of greater degree attainment in Philadelphia. Other speakers sharing the podium included Dr. Lori Shorr, his chief education officer; members of Philadelphia City Council and the Pennsylvania state Senate; representatives of Philadelphia’s education community; and Philadelphia students. We should all be grateful that we have a mayor in Philadelphia, with Michael Nutter’s leadership qualities, who has placed college degree attainment for our citizens at the top of his agenda. In their presentations, Mayor Nutter and Dr. Shorr provided compelling information in support of the new office, and the work being done throughout the City to help Philadelphia increase its success in this area. Mayor Nutter’s comment that the office is the only one of its kind in America made us all feel like we were a part of Philadelphia history that day, and that we have created a model solution that could be applied across our great country. The Peirce College community has taken the opportunity to come forward and support this great initiative with its high-quality capabilities and commitment. Two anecdotes related to this point I am pleased to share. 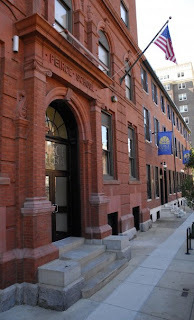 First, the Mayor singled out Peirce College for its responsiveness in contributing and setting up the technology for the new PhillyGoes2College office. Second, I met Dr. Marciene Mattlemen for the first time. She’s a Philadelphia legend in the support of education, and a former school district board member. Her daughter, Barbara Mattleman, will head up the new office. I was so proud when Marciene told me Barbara has been greatly impressed with Peirce College. Barbara has been visiting Peirce recently, since the Mayor’s Office of Education has been using Peirce’s facilities to hold their planning meetings. Before her visit, she was not aware that Peirce had grown so considerably, or that we have such superior educational resources. Seeing and hearing the student speakers reminded everyone of the importance of what we do as educators. Two personal stories were shared. One was from a young college-age student, the other from an adult learner. Both exhibited the same glow of success and pride. And both simply needed a little something extra to get and keep them on track for degree attainment. It felt great to be representing Peirce College as one member of an exceptional group of organizations in attendance, all of whom strive to enable the success of students like these. The session reaffirmed how potent a force for positive change can be, and how effectively we can create solutions, when we simply work together. Mayor Nutter mentioned several organizations, including Peirce College, that stepped forward to make the new PhillyGoes2College office possible. He noted that he didn’t have to take any money out of the City’s treasury to make it happen. The opening of the PhillyGoes2College office serves as a model for all of us to be good citizens, to support our local and State leaders, and continue to make the greater Philadelphia region among the best in the America. 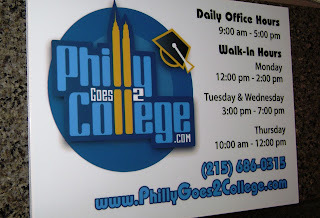 I am honored to have been in attendance during the PhillyGoes2College office's grand opening, and to represent Peirce College and our mission of serving primarily first generation working adult students in pursuit of their college degrees. It was great to once again see how Peirce is part of the solution for undereducated citizens, and how the College remains a key member of the Mayoral team in battling this problem. The Harvard Business Review recently featured a commentary on a valuable lesson that we can learn from the Conan/NBC situation. What can we learn? We can shape our destiny. When the conflict became public, the focus was on whether or not Conan was treated fairly. In his mind, he was not rewarded for his loyalty. However, authors Marc Effron and Miriam Ort point out that this is also an exercise in corporate responsibility. 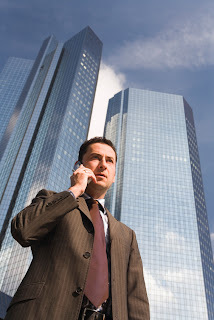 Corporations are tasked with focusing on the bottom line. Conan was an employee on the fast track five years ago and some promises were made to him. What we need to grasp is that businesses make decisions based on the “here and now.” However, events can change the course of history. When NBC made the promise five years ago, I’m sure they thought Jay’s show would do well. They missed the mark, so what were they supposed to do? I think there’s a business lesson that Peirce students can take away from this story, and it is tied to the mission of the Business Administration program. While we nurture our students in a safe environment, the business faculty prepares them to be leaders in any type of situation. It is important to understand one’s environment, stay competitive, and be marketable with a variety of skill sets. If we succeed in our endeavor, our students will never be limited in career or advancement opportunities. We challenge them to take control of their destiny. When one door closes, another one will open. Just knock! There is a silver lining for Conan. An opportunity has arisen. Although he has to wait until September to go back on television, he is harvesting another opportunity and passion: live comedy in New York. So a reminder to our Business Administration students and graduates -- shape your own destiny! Use what you learn at Peirce to navigate the business world and keep opening those doors onto new opportunities. Philadelphia Mayor Michael Nutter and the Office of Education today officially launched the PhillyGoes2College Initiative (PG2C). PG2C is an important part of Mayor Nutter's efforts and programs to help educate city residents and help them pursue degrees and certifications in higher and continuing education. Peirce College is proud to have played a part in helping to get this important initiative off the ground by installing computer equipment and technology for administrative staff last week in the PhillyGoes2College's offices in City Hall. Peirce's CIO, Chris Duffy, oversaw the installation and made sure everything was up and running for this week's launch. The primary goal of the office center staff is to help students and parents navigate the college application process. A full press release that details our role is included below. "The overall purpose of the PhillyGoes2College Initiative is to motivate more youth, adults and current college students in Philadelphia to pursue and complete college. Moreover, by involving all segments of the community in this initiative, Philadelphians attending or planning to attend college in the region, will realize that Philadelphia is the ideal city to earn a college degree and to live in while pursuing a rewarding career." While everyone is dealing with the snow that's still piled high around Philadelphia, I'm going to take a moment to look forward to some events planned for Spring and Summer 2010 at Peirce College! One of the many resources available to students at Peirce College is the First Year Initiative (FYI). From the moment a student enrolls at Peirce, they can find support through a variety of programs and services that are 100-percent focused on the needs of our first-year students. Each session, FYI provides additional support to new and returning students via workshops to brush up on English, math, and basic computer skills. By attending, you can learn what the expectations are for entry-level classes, while also receiving workshop attendance credit for your participation. For now, I want to give you all a heads up of what is to come over the next few months. 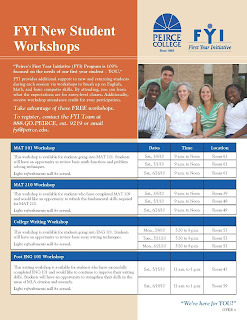 You can register for the following Spring and Summer 2010 FYI New Student Workshops by contacting the FYI Team at 888.GO.PEIRCE, ext. 9219, or email the FYI Team. And one more thing, they're all FREE! While our original Black History Month event had to be postponed due to Philadelphia's record snow fall, I have some great news -- we have officially rescheduled! The celebration will now be held next Friday, Feb. 26, from 6 p.m. to 8 p.m. in College Hall, Room 51. 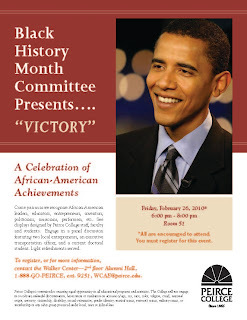 The event, "Victory: A Celebration of African-American Achievements," is a collaborative effort between Peirce students, faculty, and staff that seeks to recognize African-American leaders, educators, entrepreneurs, inventors, politicians, musicians, performers, etc. A special panel presentation will feature two local entrepreneurs, an executive transportation officer, and a current doctoral student. Juanita Wooten, Program Manager for Student Services and the Black History Month Committee, has been working hard with her team to reschedule this fantastic event, so don't miss it! Remember -- all are encouraged to attend, but you MUST register! To do so, contact the Walker Center (2nd floor, Alumni Hall) at 888.GO.PEIRCE, ext. 9251, or WCAE@peirce.edu. Students may also log on to the my.peirce.edu portal and click on the Student Services tab for more information. Now let's cross our fingers and hope the weather cooperates this time around! Recently, I met with Philadelphia Chamber of Commerce President and CEO Rob Wonderling to discuss a number of topics dealing with economic growth, education and the Philadelphia region. Rob offered some great insights into higher and continuing education's role in the region's economic success. Rob and I discussed the issue of municipalities taxing higher education tuition, which surfaced in Pittsburgh earlier this year. Thankfully, the measure there never moved forward. However, it does create future concern not only for students and schools, but also for the economic viability of cities and regions across Pennsylvania. Along with Villanova president Rev. Peter M. Donohue and Daniel K. Fitzpatrick, president and CEO of Citizens Bank-Eastern PA/NJ/DE, and 2010-11 chair of the CEO Council for Growth, Human Capital Working Group, Rob authored a great op-ed for the Philadelphia Business Journal weighing in on the topic (note, requires a subscription to view full story). The op-ed, "Higher ed is too important to harm with tax," outlines why a tuition tax is the wrong choice for Pittsburgh, Philadelphia and the State of Pennsylvania. "Higher education is essential to the economic health of the region, accounting for as much as 6 .9 percent of its economic activity, including spending by visitors and capital construction projects. Colleges and universities also contribute to our quality of life, presenting lectures, exhibits and plays. Some provide police protection beyond campus borders. Students and faculty volunteer their time and talent to community organizations." At Peirce College, we believe that higher education is crucial to moving beyond economic hardship, creating a skilled and credentialed workforce, attracting new and better employment opportunities and creating a sustainable economy. While it's important to find the funds necessary to run government services and help make up budget shortfalls, taxing tuition would have an adverse impact that lasts well beyond a down economy. I've been a part of the Peirce family for quite some time, nearly eight years in fact. My name is Dr. Marie Gould and I'm a Professor of Management and the Faculty Chair for Business Administration here. I oversee the activities and faculty of the Business Administration Program, and work with the Association of Collegiate Business Schools and Programs (ACBSP) and other professional and academic organizations on behalf of the College. I came to Peirce with both corporate and higher education experience. From my perspective, what I offer the College is twofold -- an understanding of how to best meet the needs of corporations through higher education programs directed at professional development, as well as preparing students for graduate school. Since joining Peirce in 2002, I have spearheaded the implementation and development of two new Business Administration concentrations: Human Resource Management and Entrepreneurship/Small Business Management. I am pleased to announce that Philadelphia Mayor Michael Nutter will deliver the keynote address at this year's Commencement ceremony on Monday June 14th. The full press release detailing the announcement is below. We're honored to have Mayor Nutter as a speaker, particularly because he shares Peirce's vision for educating Philadelphians and helping them gain access to higher and continuing education. More details about commencement will follow in the coming weeks. 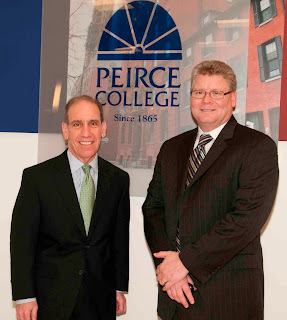 On Feb. 4, I was honored, on behalf of the College, to host Rob Wonderling, President and CEO of the Greater Philadelphia Chamber of Commerce, on his first visit to Peirce. 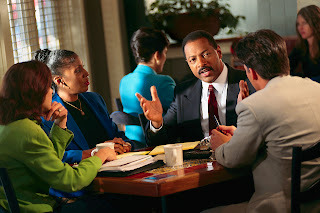 After exchanging stories about how we arrived in our current roles, the conversation quickly turned to business. It became readily apparent minutes into our discussion that higher education is a key element of Rob's vision to expand the Chamber. It was encouraging to hear that he clearly understands the importance of institutions like Peirce in the workforce development that leads to regional job growth. His agenda has already led to his endorsement of more funding at the state level for colleges and universities in the Greater Philadelphia region. Rob and I also spoke about how Peirce can become more engaged with the Chamber in the future. Knowing my goal to expand Peirce's visibility in the business community, he invited me to join a small networking group he periodically convenes at the group's next dinner in March. The most intriguing aspect of our meeting, however, was a proposal Rob made to connect Peirce students (and possibly alumni) to the resources and networking capabilities that can be derived from Chamber membership. The Chamber, of course, could also potentially begin offering individual memberships and grow its base. This is significant, as the concept could provide Peirce College, our students, and alumni with many advantages, including better opportunities for student career placement and advancement; and marketing of the College's programs to Chamber members. We agreed to the next step of getting a team of Peirce and Chamber representatives together to explore the feasibility of implementing the concept as a pilot by this coming summer. Rob also took a tour of our facilities, and was impressed with the creative architecture and state-of-the-art classrooms. Aware that we are hosting a Marketing Roundtable for the Chamber in March, he shared that he was thinking of additional usage of Peirce's facilities for Chamber programming. As an expression of appreciation for his interest in Peirce, I offered him the opportunity to use the space for internal staff meetings or retreats. As we shook hands to end the visit, it was apparent that we've begun a new relationship with the Chamber and through Rob -- one that has significant potential to advance both of our organizations. I invited him to our Spring Reception on May 17 and he marked it on his calendar. I'm hopeful we will have another opportunity to meet and discuss collaboration, higher education, and the Philadelphia region in the near future. We have received great response and feedback regarding our planned Black History Month event scheduled for this evening (2/5/10). Unfortunately, due to the expected inclement weather this afternoon/evening, the event will be rescheduled to a later date. Look for updated details regarding the new date and time in the coming week. And of course, everyone take care when traveling over the next couple of days! In celebration of Black History Month, I'd like to invite all who are interested to join the Black History Month Committee on Friday, Feb. 5, 2010, from 6 p.m. - 8 p.m. for "Victory: A Celebration of African-American Achievements." The program is a collaborative effort by Peirce students, faculty and staff that seeks to recognize African-American leaders, educators, entrepreneurs, inventors, politicians, musicians, performers, etc. Come out for an insightful panel presentation featuring a local entrepreneur, education administrator, doctoral student and more, and enjoy light refreshments. The event will be held in College Hall, Room 51. All are encouraged to attend, but you must register before Friday! To do so, you can visit the Walker Center (2nd floor, Alumni Hall), or contact us at 888.GO.PEIRCE, ext. 9251, or WCAE@Peirce.edu. Feel free to stop by my office or ask me directly if you have any questions by commenting below! Further information about this or other Black History Month events is also available by logging onto the my.peirce.edu portal and clicking on the Student Services tab. Whether you have been studying all semester or your finals tend to sneak up on you, don't forget that Peirce College always has student support services available, to help you prepare for exams and final projects. The Walker Center for Academic Excellence will be hosting a Study Day for all students on Saturday, Feb. 13, from 10 a.m. to 2 p.m. Faculty and tutors will be on hand to assist all Peirce students with assignments and test preparation. A variety of other helpful resources will be available. To keep your energy up, light refreshments will be served. To ensure we can accommodate your study needs, please register as soon as possible by contacting the Walker Center at 888.GO.PEIRCE, ext. 9251, or WCAE@peirce.edu. The registration deadline is Tuesday, February 9, 2010.